Good compost is made up of five components: carbon materials, nitrogen materials, air, water, and beneficial microbes. Composting is the natural process whereby organic matter breaks down into a state that improves soil texture and moisture retention while feeding the soil microorganisms essential to plant growth and health. Northern New Mexico soils are often low in organic matter so adding compost to garden, flower beds, trees, etc. several times a year can make a big difference. Turn the pile at least once a month to let in air. Turning speeds up the composting process, but even if it’s never turned, a properly made heap will rot down in six months to a year. 1. How to build? Use commercial compost bins or make one from wood, discarded pallets, wire mesh, cinder blocks, or straw bales. 2. How large? For optimum results, at least 27 cubic feet which creates an interior space 3 feet wide by 3 feet deep by 3 feet tall. A pile of at least 64 cubic feet in area (4′ x 4′ x 4′) could do even better, particular during the winter and early spring, because its volume is great enough to protect its living warm interior from encroaching frost. 3. Where to place? 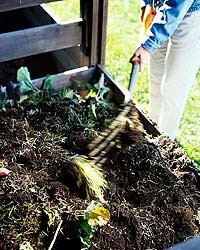 Composting should be done in full sun or a minimum of six hours of direct sun per day. 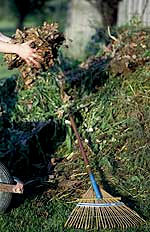 Worm castings usually contain worm eggs that hatch in the compost to enrich and aerate it. Live earthworms are good to compost, night crawlers are not. 5. Adding water Before placing each layer of compost lightly water it. Make it moist, not soggy — like the moistness of a wrung-out sponge. it’s too wet If, when you push down on the compost water leaks, . Check the pile every five to seven days to determine if it is drying out or getting too wet. 6. Turning Turn the pile at least once a month to let in air. Turning speeds up the composting process, but even if it’s never turned, a properly managed compost will eventually decompose. 7. When will it be ready to use? As it matures, it will shrink. Finished compost is dark brown to black, with a crumbly texture. 8. How to use? Add the compost to enrich potting soils for use with container growing indoors or out. It can be added directly to both new and existing outdoor garden beds. Spread it over outdoor beds at a depth of two to three inches. When using compost as mulch for trees, shrubs, or other plants, be sure to leave a three-to-four inch gap around the plant’s trunk or stem. This is because the above-ground parts of the plant cannot be constantly moisture or fungal disease may develop.